Sen. Dan Sullivan is adamant that news reports and sound bytes creating a perception of unprecedented partisanship on Capitol Hill ignore the underlying cooperation that continues in Congress. “Of course there’s some principled differences that you read about daily between Democrats and Republicans on key issues: resource development, ANWR, tax reform, health care, to some degree, but on some really big, important issues there’s a lot going on — that we’re getting done — and it’s bipartisan,” Sullivan said during an Aug. 3 editorial board meeting with the Journal and the Anchorage Daily News. For starters, he pointed to the National Defense Authorization Act, which lays out the spending plan for the Department of Defense each year. Sent to President Donald Trump Aug. 1, the $717 billion NDAA for the 2019 fiscal year that begins Oct. 1 passed the Senate on an 87-10 vote. The House approved it in late July on a vote of 359-54. It further reversed the sequestration cuts to Defense spending from 2010-16 and is an $18 billion increase over the 2018 bill. The bill includes a 2.6 percent pay increase for service members. Sullivan described it as “a generational shift that focuses more on China and Russia versus Al Qaeda and terrorism, although that’s still up there,” he added. The 2019 NDAA contains another roughly $300 million worth of military construction projects in Alaska, which brings the three-year running tally here to $1.3 billion, Sullivan noted. Most of money is headed to the Interior where work to add 28 new intercontinental ballistic missile, or ICBM, interceptors to Fort Greely’s existing missile defense system is ongoing. Work is also continuing at Eielson Air Force Base near Fairbanks in preparation for the two squadrons of F-35 fighters scheduled to arrive at the base starting in 2020. More than 2,700 personnel will accompany the fighters, according to Defense reports, and preparing Eielson for the squadrons is estimated to cost a total of $453 million and generate more than 2,300 construction jobs in the state. 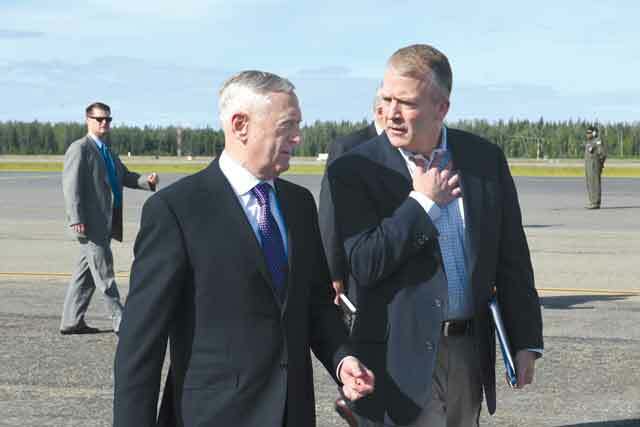 Sullivan and Defense Secretary James Mattis toured Eielson and Fort Greely in late June. “It is smoking right now, which is great for the (Alaska) economy and for national defense,” Sullivan said of the construction activity at the Interior installations. In addition to the work at Eielson and Fort Greely, the Missile Defense Agency is in the midst of spending another $325 million over six years at Clear Air Force Station just south of Fairbanks. The money there is going towards installing a new power plant and missile detection radar system. Sullivan will be hosting the secretaries of the Army, Navy and Air Force as well as the new commandant of the U.S. Coast Guard following a four-day trip to 14 Western Alaska communities. He and Navy Secretary Richard Spencer will visit Nome and Adak as part of the Alaska congressional delegation’s continued push for the feds to assist in building a strategic “Arctic” port somewhere on Alaska’s west coast, he said. Sullivan also pointed to the NDAA as proof that Congress as a whole is finally warming on Arctic issues, as it provides the Defense Department the authority to contract for up to six polar-class icebreakers. A contract for the first DOD-funded vessel is to be awarded sometime in 2019 with construction of the second starting in 2022 and the rest coming on a one-per-year schedule. He acknowledged, however, that actually paying for the vessels will still be subject to the annual appropriations process, which has been bungled for years. “(Russian President Vladimir) Putin has called the Arctic the new Suez Canal and he’s going to own it with his 40 icebreakers. And they’re building 13 more and they’re weaponizing them; they’re making them nuclear-powered,” Sullivan said, noting China is also expanding its icebreaking fleet. He also provided a little insight into the closed-door NDAA markup in the Senate Armed Services Committee, which he serves on. According to Sullivan, committee leadership from both parties were against his icebreaker provisions, fearing they would “gut” the Navy’s shipbuilding budget, but they survived with unlikely help. Sullivan admitted even he didn’t know how the vote would shake out after a spirited debate. “I asked for a roll call (vote) and it really was actually kind of funny because you just go to each member and there was completely no rhyme or reason — the chairmen of the committee voted against me, the ranking Democrat voted against me, some of my more hawkish Republican foreign policy allies voted against me and (Massachusetts Democrat) Elizabeth Warren voted with me and we won,” he recalled. If this year is any indication, there is reason to hope the icebreakers will be paid for, as the traditional process for funding the government is working again, for now, at least. Congress has passed seven of the 12 annual appropriations bills before August for the first time since 2000, another achievement which Sullivan noted requires bipartisanship as the bills need 60 votes to pass the Senate. He said newer senators, such as himself elected in 2014, have pushed particularly hard against further omnibus funding packages, which have become the norm in recent years and generate bipartisan disdain amongst rank-and-file legislators. “The only people in my view that like (omnibus appropriations) are the leadership, on both sides. Republicans and Democratic leadership — (Senate Minority Leader Chuck) Schumer, (Senate President Mitch) McConnell, (House Speaker Paul) Ryan, (House Minority Leader Nancy) Pelosi — because they negotiate the whole bill,” Sullivan commented. Sullivan agrees with McConnell’s decision to cut the Senate’s August recess from the traditional five weeks down to one, a move fellow Alaska Sen. Lisa Murkowski has expressed unequivocal disdain for. Many in the Senate have complained about a simple lack of time to hear the spending bills or vote on presidential appointments, according to Sullivan, who dismisses that excuse. Murkowski said in June that she opposes cutting the recess because it’s difficult for senators from such far-flung states to meet with constituents — or family — on weekends during session when their colleagues can make a quick trip home. “My view is, well then let’s make more time. Sen. Murkowski says let’s work on weekends. I’m all for that but we also shouldn’t be taking a five-week recess,” Sullivan said. As chair of the Senate Subcommittee on Oceans, Atmosphere, Fisheries and the Coast Guard, Sullivan is planning to hold a hearing on the causes behind Alaska’s numerous struggling salmon stocks shortly after the Senate reconvenes. He noted that salmon management is mostly a state issue, but the general belief that ocean conditions are playing a large role in poor returns — with little knowledge beyond that — makes it a federal concern as well. “There’s all kinds of theories but we need to get our arms around (poor salmon runs), which is really impacting a lot of people,” Sullivan said. National Marine Fisheries Service Administrator Chris Oliver, an Alaskan who served for nearly 20 years as the executive director of the North Pacific Fishery Management Council, will participate in the hearing, according to Sullivan, who added that he advocates for fully funding NOAA’s scientific research budget. Sullivan has been particularly focused on ocean acidification, which has the potential to disrupt shellfish fisheries as well as some species of plankton that are the diet foundation for numerous North Pacific fish stocks. Federal disaster declarations stemming from some of this summer’s weak sockeye and chinook runs are likely, he said. In June, Commerce Secretary Wilbur Ross allocated $56 million for Alaskans impacted by low pink salmon returns in 2016. That money was part of $200 million approved by Congress for nine fisheries disasters nationwide. Sullivan treaded lightly when asked if Trump’s routinely impulsive behavior and sharp denigration of his critics has contributed to damaging the country’s social discourse. He emphasized a general need to be “respectful and civil” when addressing contentious issues. “I think that’s critical; and I’ve called the president out when I think that doesn’t happen,” Sullivan said. A supporter of many of the Trump’s policy objectives, Sullivan said he agrees with the president that the country’s trade deficit with China needs to be balanced, but he thinks the administration is taking the wrong approach. He said he calls the president directly when he has issues with policy or strategy, and the two have had multiple conversations about trade in recent months in addition to similar discussions with top Commerce officials in the administration. He said he specifically pointed to the 25 percent retaliatory tariffs China has imposed on U.S. seafood imports, which has hit Alaskan fish exports. In 2017 China imported $796 million worth of Alaska seafood, which accounted for nearly one-third of the state’s total seafood exports last year. “I’m like, ‘Mr. President, we’re having retaliation on a huge export market for me and my constituents and he and (Commerce Secretary) Wilbur Ross are saying, ‘Tell them we’re actually trying to open those markets for them in China,’ which I think they believe but it’s been a challenge,” Sullivan said. Still, he emphasized that major domestic policy victories on things such as oil exploration in the Arctic National Wildlife Refuge, regulatory and tax reform and judicial appointments and a strong national economy are all major positives. “Overall, as I think you can tell, I think things are going on a good path,” Sullivan summated.